Driven by widespread expansion of the automotive industry, the global pressure sensors market is poised to develop consistently at a 6.2% CAGR between 2014 and 2020. A recent report published by Transparency Market Research on the global pressure sensors market forecasts the market to reach an estimated value of US$9.36 billion in 2020, up from its valuation of US$6.53 billion in 2013. The report is titled “Pressure Sensors Market - Global Industry Analysis, Size, Share, Growth, Trends and Forecast, 2014 - 2020”. The report cites increasing production of motor vehicles as one of the primary growth drivers of the global pressure sensors market. Additionally, the industry has also hugely benefited from the latest government regulations mandating the use of pressure sensors in automobiles. Increasing adoption of technological advances such as MEMS or microelectrochemical systems has played a crucial role in boosting demand for pressure sensors. Furthermore, rapid urbanization observed in Asia Pacific and the Middle East has also helped the market chalk out a strong growth trajectory. However, consumers continue to remain apprehensive about the purchase of pressure sensors owing to their high installation cost. The report identifies this as a crucial bottleneck that manufacturers need to address to ensure sustainable growth. Nevertheless, introduction of technological advances will enhance the growth opportunities for the market in the near future.On the basis of sensor technology, the report classifies the global pressure sensor market into electromagnetic, piezoresistive, capacitive, optical, and resonant pressure sensors. Of these, the market for piezoresistive sensors was valued at US$1.82 billion in 2014, which accounted for the lion’s share of the market. The segment will continue to dominate the market over the forecast period as well, according to the report. Among the market segments based on application, the automotive sector led the market in 2014 with an estimated value of US$1.69 billion. This segment will continue to lead the market during the forecast period as well, due to the boost in motor vehicle production around the world. However, the report indicates that the consumer electronics segment will register the fastest growth at a healthy 6.9% CAGR during the forecast period. 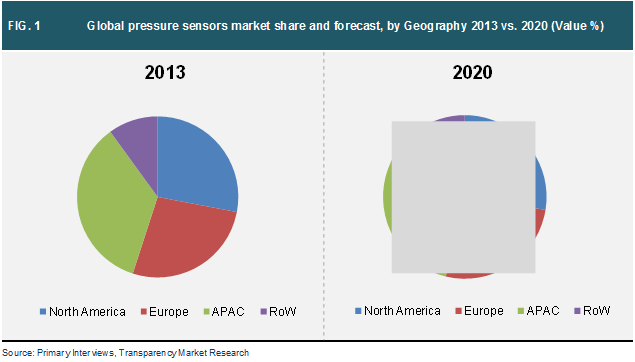 Geographically, Asia Pacific led the global pressure sensors market in 2014 and the region will remain the most lucrative market for pressure sensors during the forecast period as well. Increasing production of motor vehicles in India, China, Japan, and South Korea will significantly contribute to the expanding pressure sensors market in Asia Pacific. The region will be closely followed by North America and Europe, according to the findings of the report. Apart from discussing the trends, drivers, bottlenecks, and opportunities regarding the global pressure sensor market, the report also profiles key market players to analyze the competitive landscape. Some of the leading companies in the market profiled by the report are Freescale Semiconductor Ltd., Emerson Process Management, Schneider Electric SE, ABB Ltd, Analog Devices Inc., Omron Corporation, Honeywell International Inc., Delphi Automotive PLC, STmicroelectronics N.V., and Robert Bosch GmbH.